Late Thursday afternoon has been a good time to find the range empty of other shooters, and so it was this visit. I’ve been wondering if folks are preserving their ammo, or the intrusive ROs have been driving people away. In any event, it’s a win for us. We started out shooting slowly at 7 and 10 yards. After a bit we moved back to 15 yards. 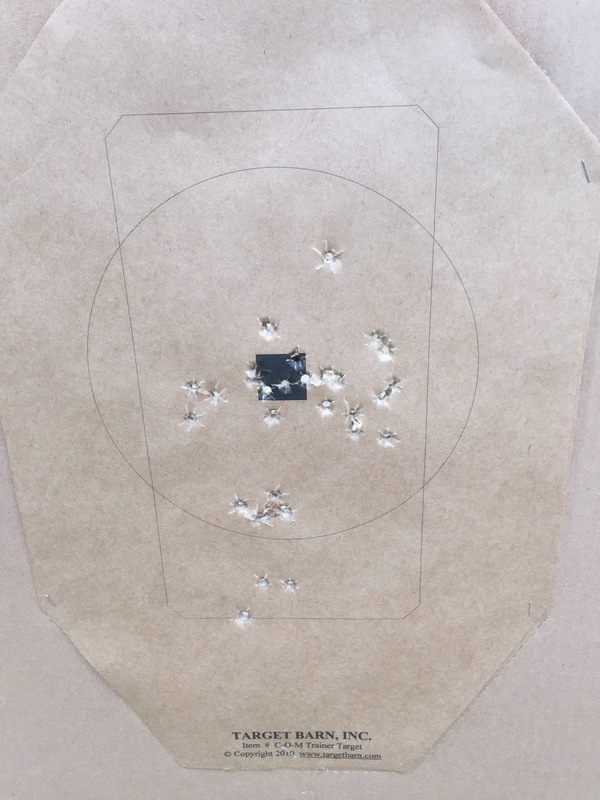 Colleen was shooting a Smith & Wesson M&P Shield, and wanted to improve her accuracy at the longer distance with the small gun. So after each round, we checked our targets, and she would announce “Let’s do it again.” We spent quite a bit of time doing slow fire at the 15 yard line. I found that exercise to be beneficial myself. It’s good to spend time really concentrating on maintaining sight alignment and an even trigger squeeze. My eyesight is such that the edges of the sights are generally sightly blurred, and the targets very much so, so the concentration was good, and I was pretty pleased. “Checkered Flag” had also joined us for the fun, so eventually we started working on his favorite “precision” exercise; shooting out a black paster. We did this from both 7 and 3 yards. Why does it always seem to be the last shot of an 8 or 10 round string that goes astray? After seeing Colleen’s target, I suspect she’ll be challenging us to the Dot Torture Drill in the near future. When it was my turn to pick the drill, we got in some single handed shooting. 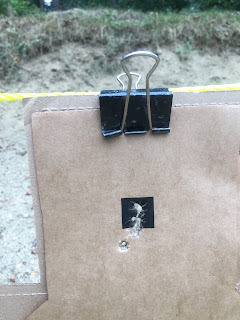 I try to dedicate at least a magazine to both strong and support hand shooting at every range trip. While it may not be the “traditional” anniversary celebration, it works for us. We had a very fun couple of hours outdoors doing something we both enjoy. Most of my range visits I make by myself, so it really was a special “date.” On the way home, Colleen treated us all to overpriced coffee at the local Starbucks too. And we’ll do that dinner this weekend.